As I mentioned before, I tend to think of shortbread and icebox cookies at this time of year. 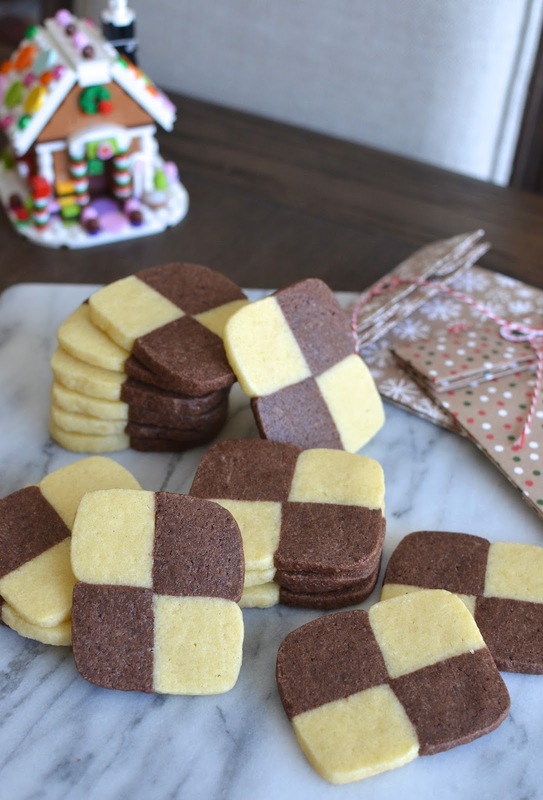 If you're like me, you've probably had quite a few batches of Christmas cookies coming out of the kitchen and been savoring plenty of holiday goodies in general. That said, let's squeeze in one more recipe for this holiday season. Have you ever had Almond Roca? They are small log-shaped buttercrunch/toffee coated in chocolate and almonds. Growing up, they were the only candies I can remember my mother liking. I used to eat them, too, and while they weren't my very favorite, I certainly enjoyed them and loved scraping off the chocolate and almond coating and then biting into that crunchy toffee center. Last month, I caught a cookie roundup over at Kelly's blog (I do enjoy seeing all the holiday recipe roundups and gift guides at this time of year) and saw a recipe for Almond Roca cookies...it made me think of all those red tins of Almond Roca we used to have around the house during the holidays or around Chinese New Year. So I thought it would be fun to make these cookies, which are essentially shortbread with sliced almonds and toffee bits folded in. To simplify things a little bit, I used chocolate-coated toffee bits (instead of plain) and omitted the chocolate coating on top of the baked shortbread. 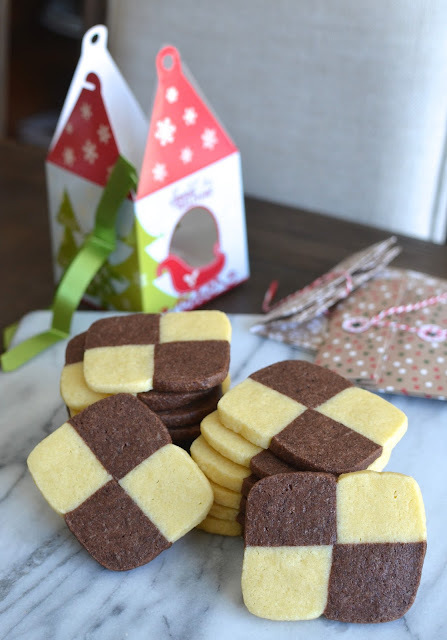 These were a fun version of shortbread to make and eat! They have that classic sandy texture with extra crunch from the almonds and toffee bits. 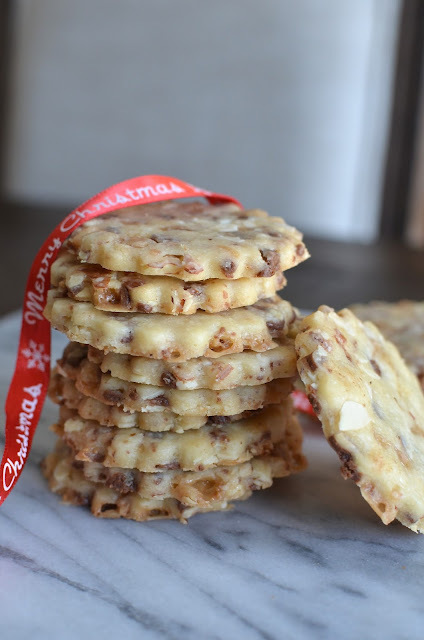 If you like nuts and crunch in your cookies, this Almond Roca shortbread is a great rendition to try one day. "Operation: Make/Eat Christmas Cookies" is in full swing! Basically, I make it a leisurely monthlong process at my house. I make cookies, we eat cookies, and we repeat this simple process. I know some people make Christmas cookies in one frenzied swoop right before the big day and I love this idea of turning my house into a cookie factory for a day with a massive output but I never could figure out how to make that work. Stretching it out, generally enjoying it a batch at a time, works for us and that's what we do throughout late November and December. So in the spirit of making and eating cookies during the holiday season, here's my latest contribution. No surprise "crackle" (or "crinkle") cookies make an appearance because they usually do. Their snow-topped appearance makes them perfect for the winter and holiday time. I've made a few versions and I'm always looking for another to try during this time of year. When I saw this recipe for red velvet crackle cookies, I knew I'd found the one for this holiday season. I saw the recipe in this lovely Holiday Cookies book. Naturally, I liked the red velvet aspect - the color fitting for the holiday season. I also liked that the recipe had not only cocoa in it but also melted chocolate. And brown, rather than granulated, sugar suggested a nice soft, moist texture that appeals to us. Sure enough, these red velvet crackles were very chocolaty and moist. They are chocolate crackle cookies dressed in red for the holidays!